Mount Damavand, 69 kilometers northeast of Tehran, is the highest mountain in Iran, the Middle East and the highest volcanic peak in asia. It has an elevation of 5,670 meters and its summit shows a small concave crater. It is an inactive volcanic mountain which was activated in the Quaternary Period. It has numerous thermal springs. 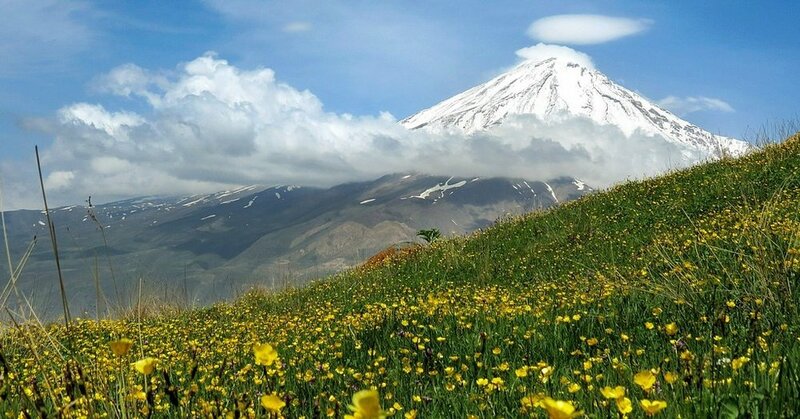 The peak of Damavand is covered permanently with snow during the entire year. The most important thermal springs are Ask and Larijan. The flora and fauna is very rich and include about 2000 plant species. There are numerous endemic species which are important to flora of the world. Since I remember I’ve always been in love with nature and the mountains. They’ve always been with me, even in my earliest childhood. I had the privilege to be taught that by my late father from a very early age. I recall very fondly, going to Mount Damavand and the surrounding areas, walking, hiking on the footpaths, going to the thermal springs, catching trout from the river, cooking them on log fires, enjoying wonderful times with my parents and my brothers and sister. What wonderful times we had in the company of Mother Nature.